The main tool that has been recommended for use in the process improvement at Lloyd Coils Europe is the Six-Sigma method. In order to develop the right process improvement technique, the process designer will implement the Six-Sigma tool of process improvement. Such modelling visualization will ensure the process designer is able to understand a number of functions within the process. It will involve understanding of the current process and establishing the associated weaknesses so that a strategy for improvement by correcting such weaknesses can be implemented. In the Six-Sigma approach, the main processes will follow the DMAIC system which includes defining, measuring, analyzing, implementation and controlling processes (Bertels, 2003). In the defining stage, the process designer will determine the current problem faced by the company and the requirement for satisfaction of customers. For the case of Lloyd Coils Europe, it is observed that the company faces the problem of not achieving the right output in the production of heat exchangers. Thus, a strategy needs to be formulated which will ensure that such output will be achieved. The measuring stage involves establishing the current progress of the company in production of heat exchangers (Borbye, 2009). According to the current state of production, it is observed that little progress has been made and the company could not achieve its desired outputs. The next stage will be the analysis stage. It is where the process designer will analyze the problem by identifying the contributing factors to it. The implementation stage involves strategies that will be used to overcome the existing problems in the company. It will be followed by the control stage that involves sustaining the suggested changes in processes of the company. Implementation of the DMAIC process will take place in the order, in which the components of Six-Sigma strategy are explained. In the measuring stage, the company will establish the reliable metrics and the extent to which progress has been made towards the desired goals. It will also involve defining customer expectations and identifying possible processes in the production of heat exchangers, obtaining historical data regarding failures, analyzing fallouts and revealing possible problems (Carreira & Trudell, 2006). It will also involve performance of system analysis where precision, accuracy and reliability of facilities used to produce heat exchangers will be established. It will be followed by analysis stage where the system will be analyzed to ensure gaps are eliminated between performance or processes and the objectives of the company. 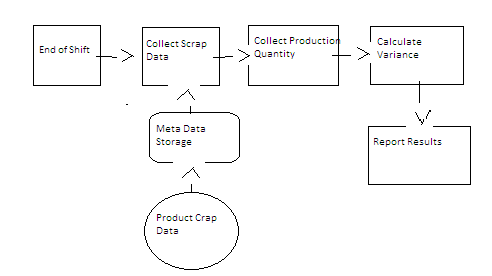 The process designer will also have to analyze the potential contributing factors and apply the statistical analysis in examination of possible variables that have impacts, as well as ensure that root causes are identified. It will be followed by identifying the list of factors impacting the outcome of the processes. The process designer will then perform systems and process capability and establishing limitations, while ensuring that the processes can accomplish their intended capabilities (Misra, 2008). In the improvement stage, the process designer will develop methods, in which the current defects in processes can be improved, such as techniques of production. In addition, methods of controlling machine failure will be determined so that production is not interrupted. The process designer will then plan design experiment and perform it so that a significant factor is established. The corrective action will then be implemented so that causes of defects in operation of machines in the company are prevented, which will help achieve the stability and predictability of the machinery. The final stage of application of the Six-Sigma tool in process improvement will be the control stage. It is where the new system will be controlled by implementing ongoing methods so that the current problems do not recur. Further, the institutionalization of the improved system will take place through modification of policies, procedures and instructional methods. Control methods will be established on the basis of special cause variation by means of statistical process control methods. Lastly, the improvement process will be documented through recording of all the processes involved in the process improvement by applying the decision tree. In order to apply the suggested process improvement tool at Lloyd Coils Europe, it is necessary to use specific methods. They foresee the implementation of the tool through management of activities in a particular shift, such as collection of materials to be used and determining the target production quantity within a particular period. It will also involve storage of data regarding the quantity of raw materials required and creating a record of such data. Establishing the skills required to perform particular tasks during production process and providing training for employees on such skills will follow. It will also involve management of time by ensuring proper supervision of employees so that they could achieve a particular output within a stipulated time. It will help achieve the production output, as well. In the above figure, the processes involved include the removal of scrap from production process in each plant. The processes also foresee that each shift has to determine the scrap percentage and the number of finished products that have been manufactured during the working time. It will be followed by collecting the total information provided by the shift and estimating the associated costs. Such process will be initiated automatically at the end of each shift through collection of manufactured products. The implementation of the suggested process improvement strategy will require the application of the right organizational management structure which accounts for suggested solutions to processes involved in the production of the heat exchangers by Lloyd Coils Europe. It is illustrated in the figure below. Figure 2. Organizational management structure for process improvement at Lloyd Coils Europe. 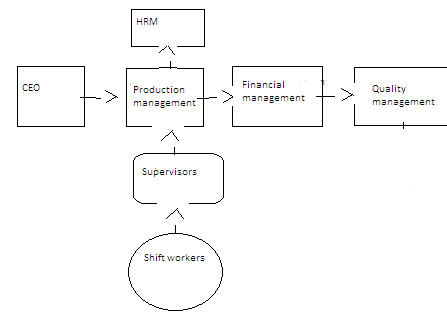 In figure 2 above, the suggested organization structure will involve the functions of the CEO. His task will be to allow policies formulation for process improvement, such as approval of assessment of current production methods and implementation of suggestions. He will also coordinate with other managers in the company to ensure any financial requirements are set aside for process improvement Production Manager will be the second controlling body in the structure. 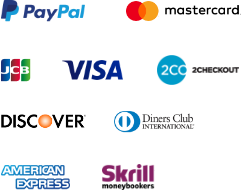 His functions will be to establish the progress made by the company in the current production techniques and determine the problems that have been encountered. He will also be responsible for coordinating with human resource department to ensure the right workforce is obtained to achieve the expected output of the company. The Human Resource Management (HRM) will be responsible for recruiting the most qualified personnel for the positions in the areas of heat exchangers production activities by the company (Rolstadås, Henriksen & O'Sullivan, 2012). They will also seek the services of experts who will provide training to employees of the company, such as shift workers so that they could apply the right strategies of production that result in increased output and reduced costs of production, while ensuring quality of produced goods. In addition, the Financial Manager will be required in the organizational management structure. He will be responsible for keeping records of costs and expenditures involved in the processes, such as the costs of raw materials and maintenance costs for machines. It will cover areas where high costs are controlled by developing the ways in which the costs can be minimized. In addition, he will be responsible for ensuring that enough financial resources are set aside to cater for purchase of raw materials, purchase of more improved machines for the processes and ensuring shift employees are provided with reasonable remuneration without delay. Quality Managers will also be part of the management team where they will contribute towards management by establishing the current quality and eliminating defects associated with current products. They will also establish the right products that should be dispatched to the market and those that should be regarded as defective ones. It will ensure the company sells only products that meet the market standards. In addition, the management structure will consist of shift supervisors. They will be required to ensure employees perform their tasks according to the suggested methods in the process of heat exchangers producing and also ensure they meet deadlines and manage time well. Due to the possibility that employees will not be familiar with the new process strategies, there is a threat that they will be less motivated to perform their tasks. It requires them to be motivated in a number of ways in order to perform their roles and implement the suggested changes in processes of heat exchangers production at Lloyd Coils Europe. It is not only achievable though provision of a decent pay but it should also be considered as a major form of employees’ motivation. The first motivation method will be to create a good working environment for employees, such as effectively designed well-aerated buildings with proper shelter from strong sunlight or winds (Bakeev, 2010). It is also important not to economize on machinery or tools by ensuring shift workers are provided with the right tools to perform their jobs properly. It will also involve making shift workers and other staff feel the support of the company by asking them to be responsible for their jobs and encouraging them to be responsible for what they do. Motivation will also be achieved through provision of training to employees by spending at least a section of the working day in the shop floor and also enabling suppliers to take part in training of employees. Workers in the processing department will also be motivated by having brief meetings with them. They will listen to their ideas, in addition to setting up clear goals and targets with the need to ensure that the shift workers are aware of what is required of them so that they could feel satisfied. In cases where the employees have performed well, it is important to tell them “Well done’ and motivate them to continue their work in the same manner. Finally, it is important to celebrate success by providing rewards, such as drinks, whenever an employee shows success in areas as, for example, a reduction in customer complaints. As a result of the above process improvement methods implementation, it is expected that there will be increased output of the company in terms of the high quality heat exchangers number which will be competitive in the market. There will also be improved utilization of raw materials, thus resulting in reduced cost of production. It will ensure the company does not spend many resources in procurement of raw materials, thus, reducing the production cost. Due to the reduced cost of production, there will be a corresponding increase in profitability of the company. Employees will also be motivated to provide their services in the areas of production to the maximum of their potential. It will result in motivation to perform their tasks with accuracy and the possibility of machines and equipment destruction will be greatly reduced. As a result of improved products quality of the company, it will be possible to attract additional customers and improve the reputation of the company greatly. Current paper contributes to the understanding of how Lloyd Coils Europe can improve the processes of production and also provides the expected outcome as a result of the implementation. According to the paper, the Six-Sigma method can be significant in ensuring that process improvement is achieved in the company. It shows that process improvement is a team affair and the whole organization must contribute towards the improvement process. It also shows that process improvement must be conducted in a language that is understandable in the company with the focus on expected outcomes and not simply engaging in ineffective communication and insulation of departments. It is caused by the fact that when the process is improved, a winning situation is experienced in most organizations and competitiveness of the company can be greatly improved. It is expected that if Lloyd Coils Europe implements such process improvement suggestion, it will be able to benefit from improved competitiveness of its employees, reduced costs of operations and improved output, which will result in improved profitability.